Applied to GIMP, as that’s where I stumble over the Save Changes dialog most frequently. That dialog appears centered over the image window, so you have to move it out of the way if you want to take a second look on the image you are about to either discard or to overwrite another version with. At least with GIMP 2.3.x and Metacity, the dialog can’t be focused separately, already making it a part of the image window in a way. The List Changes button is optional. It came to my mind because the text mentioning changes from the last x minutes is nice, even helpful in cases, but vague (well, it points the user to his own memory and time perception, so to speak). Also, the GIMP already has a history panel and the changes dialog would be similar. I wondered if the button label should end with and ellipsis (…), but the HIG tells us that it should only be used if the brought up dialog requires user input. “Discard” is much more obvious to me than “Don’t Save”, assuming that’s what that button does. GNOME should have guidelines for these dialogs. 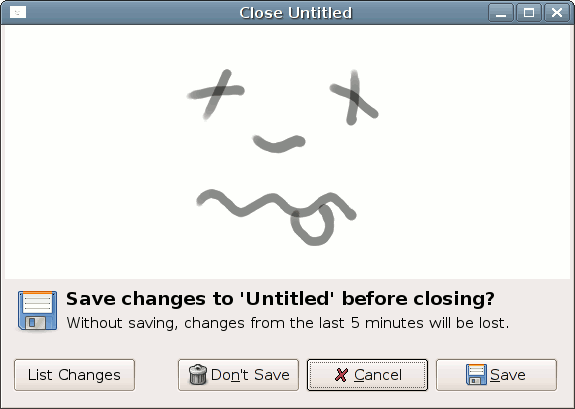 Hmm, just noticed Gedit’s dialog uses a warning triangle as symbol and that button is labeled: “Close without Saving”. “Close without Saving” is the recommended wording, but “Discard” and “Don’t Save” are both better (they’re shorter and they don’t start with C), which probably is why Gnome apps are so inconsistent in that detail. The problem with “Don’t Save” is that “Cancel” also won’t save. Also, “Don’t Save” doesn’t make it clear that choosing that option will close the image — and that is after all the action that the user requested.